Redwood National and State Park is an aggregation of California owned land which is managed jointly by the National and California Park Services. The official Redwood National Park is near the city of Eureka, but there are large clusters of giant redwood trees scattered as far south as San Francisco and all the way north at Crescent City. 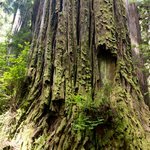 Read on to see my favorite things to see in Redwoods national park. Lake Tahoe is one of the most popular attractions in California. It is mostly known as one of the best winter resorts in the world. 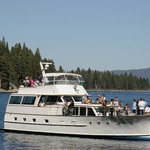 However, Lake Tahoe is a great family vacation spot in the summer as well. We found Lake Tahoe to be very relaxing and family friendly. My family found great things to see and we enjoyed the beautiful views and places to visit. 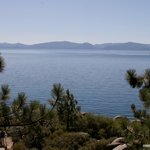 This article contains our favorite places to visit in Lake Tahoe. 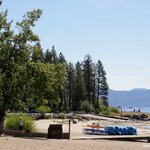 After relaxing on the beach and having lunch at Kings Beach, we drove back down through Nevada on the eastern shore of Lake Tahoe. Sand Harbor looked like a really nice place to spend the afternoon. So we did stop and we continued our relaxation into the afternoon and evening. According to the Nevada park service, Sand Harbor is the most popular, with sandy beaches, a boat launch, picnicking and group use facilities. Yep, the sandy beaches is definitely true…and much more. Lake Tahoe has some great beaches. Kings Beach is one of them. We found Kings beach a great place for a family beach day. Fine sand, shallow water and crystal clear water. There are also lots of great places to eat which adds to the fun. We visited Kings Beach in the middle of September and it was hot. Being able to sit on the beach and relax was great for our family. If you come close to Emerald Bay then you should take the trail down to Emerald Bay from the Vikingsholm parking lot up above. You get many benefits from hiking down. You not only get great exercise, but you get to experience beautiful views of Emerald Bay and Fannette Island. And yes, you will get a chance to visit the beautiful Vikingsholm castle. Driving in for the very first time to Lake Tahoe is quite an experience. The road is winding through the mountains and suddenly after many bends in the road, we got to see the Lake Tahoe basin…it is huge. We heard that the lake is very large, but when you see it from the road in one of the many vista points, the lake is indeed huge. 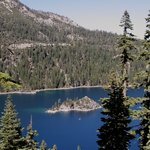 Once at Lake Tahoe, everyone told us to drive to Emerald Bay. We did drive to Emerald Bay and hiked down to the lake. This is a splendid place. Read on to find out the details. Yosemite Valley is the place where you can get some great views of the surrounding mountain peaks you can also experience some great hiking in Yosemite. 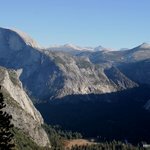 Most of the hiking trails in Yosemite lead you far from the Yosemite Valley floor, but there are some easier hikes that can be easily accessed from the Valley. The easiest and most popular hike is the Mirror Lake trail. This is by far the easiest trail in Yosemite. Mirror Lake changes dramatically with the changes of seasons at Yosemite. The views you get to see at Mirror Lake all depend on when you hike this trail. Yosemite National Park has many many options for the hiker. You can do a short or long hike, you can do an easy, intermediate or difficult hike. You choose and Yosemite delivers. My most favorite intermediate hike is taking the Mist Trail and going up Vernal and Nevada Falls and coming back on the John Muir Trail. This is where I take friends who come for the first time to Yosemite National Park. It is a beautiful trail. Yosemite National Park is one of my favorite tourist attractions in California. I usually take every chance I get to go visit this beautiful National Park. As it happens, Yosemite is one of the most popular tourist attractions in the whole state of California, so it’s a busy place. There are many places to stay in or close to Yosemite, but most of them are very expensive. For a few years now I have been staying at the Yosemite Bug since it’s close to Yosemite and very affordable. 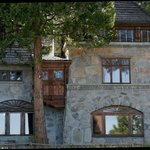 I had the privilege to ask Yosemite Bug owner Dough Shaw some questions about his own rustic mountain resort and why is it a popular place with Yosemite National Park visitors. People who visit Yosemite National Park for the first time are usually overwhelmed by the amount of information that’s available about Yosemite. After all the reading many first time visitors to Yosemite still ask the basic questions: So what are the main tourist attractions in Yosemite National Park? 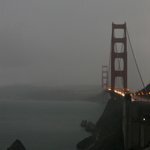 What are the must-see places? Wouldn’t it be cool to talk to someone local to Yosemite and just ask him? That’s what I did! 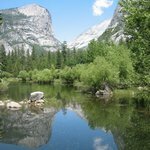 I had the privilege to ask Douglas Shaw this very questions: what are the main tourist attractions in Yosemite National Park? And he was very gracious to answer quite a few more questions. Read on to find out the best places to visit in Yosemite National Park. Yosemite National Park is my favorite California Park. I go there every time I get a chance. Most of the times I visit Yosemite National Park in the early summer or spring. This is usually the best time to see the waterfalls at full capacity. But how about the winter? I got a chance to visit Yosemite National Park in mid-November and while there was not much water in the waterfalls, I enjoyed the different colors of the trees due to changing seasons. 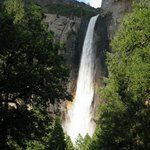 One of my favorite trails in Yosemite National Park is the Yosemite Falls trail. Read on to find out about my experience hiking this trail and to see some great pictures. I usually take every chance I get to go to Yosemite National Park. My cousin from Switzerland came to visit us and he agreed to go see Yosemite National Park for two days. Even though he lives next to the Swiss Alps, he still enjoyed the hikes and views in Yosemite. 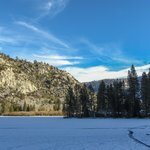 I’ll write more about visiting Yosemite, but for now enjoy the travel pictures from Yosemite: Vernal and Nevada falls, Yosemite falls and an older gallery containing Tuolumne Meadows.